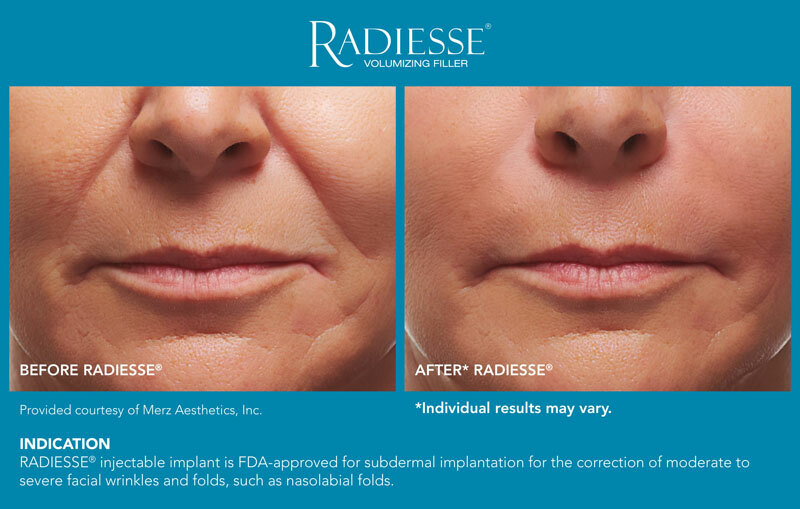 RADIESSE® and RADIESSE® (+) Injectable Implants are FDA-approved for subdermal implantation for the correction of moderate to severe facial wrinkles and folds, such as nasolabial folds. RADIESSE is immediate and subtle. It is a volumizing filler that helps minimize the effects of aging by immediately replenishing lost volume. This reduces the appearance of wrinkles and folds, bringing back a more refreshed appearance. RADIESSE and RADIESSE (+) are dermal fillers that are used for smoothing moderate to severe facial wrinkles and folds, such as nasolabial folds (the creases that extend from the corner of your nose to the corner of your mouth). You should not use RADIESSE or RADIESSE (+) if you have an allergy to any component of the product, if you have a history of severe allergies, if you have a bleeding disorder, or if you are pregnant or breastfeeding. 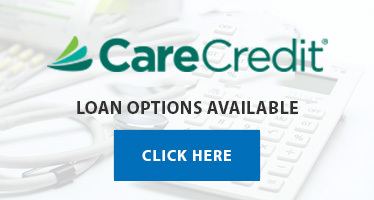 You should not use RADIESSE (+) if you have an allergy to lidocaine or medicines like it. 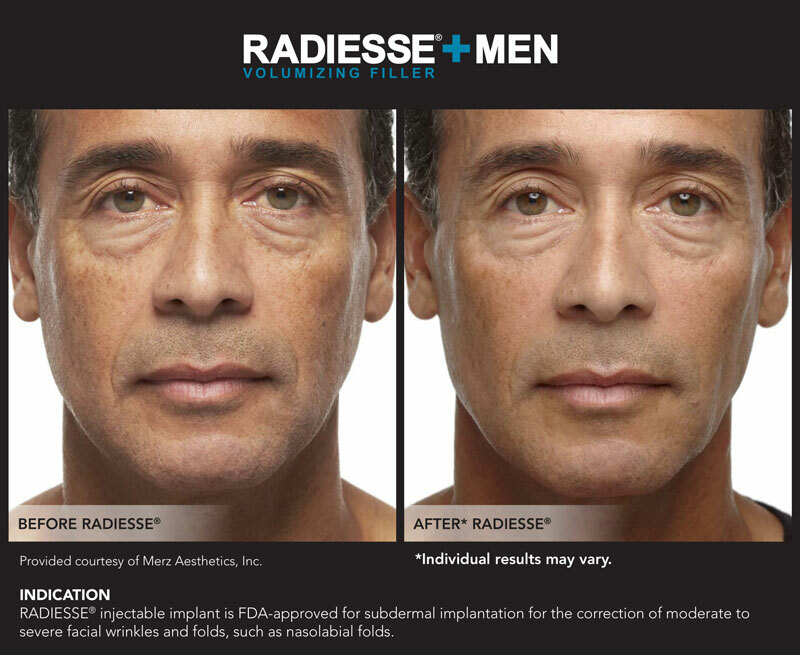 If RADIESSE or RADIESSE (+) are injected into a blood vessel, serious complications can result including stroke, vision abnormalities, blindness, temporary scabs and permanent scars. 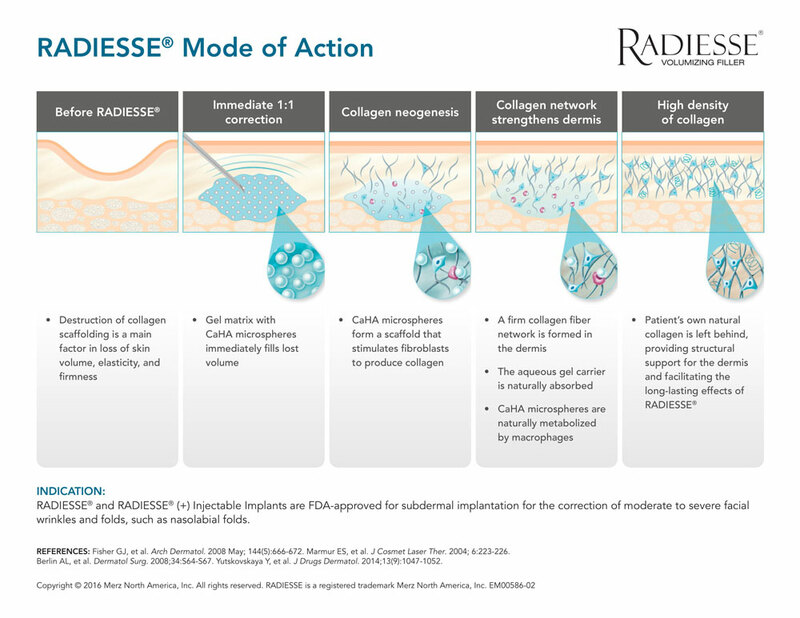 The most common adverse events seen in clinical studies of RADIESSE or RADIESSE (+) include bruising, redness, swelling, pain, itching and other local side effects. These are not all the possible side effects with RADIESSE and RADIESSE (+). For full RADIESSE and RADIESSE (+) safety information, including adverse events collected outside clinical studies, please view the RADIESSE and RADIESSE (+) Patient Information Guides available at www.Radiesse.com or from MyMerz Solutions at 1-844-469-6379.